Feeling: Everyone always says the second trimester is the one where you will feel the most energy and when you will feel well. I was starting to wonder what was going wrong to be honest. While I certainly haven’t been poorly or suffered any awful symptoms, I really wouldn’t call what I was feeling energetic, or indeed well either. On Wednesday night, I hit a wall of ridiculous tiredness and had to go to bed at 6pm when I got in from work. I slept til 8, got up, ate and went back to sleep. That seemed to somehow restart my system and since then I’ve been feeling so so so much better. I have definitely got more energy, I’m less sluggish, and I feel much happier. Long may it continue. Otherwise, everything is pretty normal really, random aches and pains by the end of the day and a pretty sore back if I don’t move around regularly, but nothing to worry about. The only annoying this is that I seem to be having daily nose bleeds, which are a bit of a time waster until they pass. 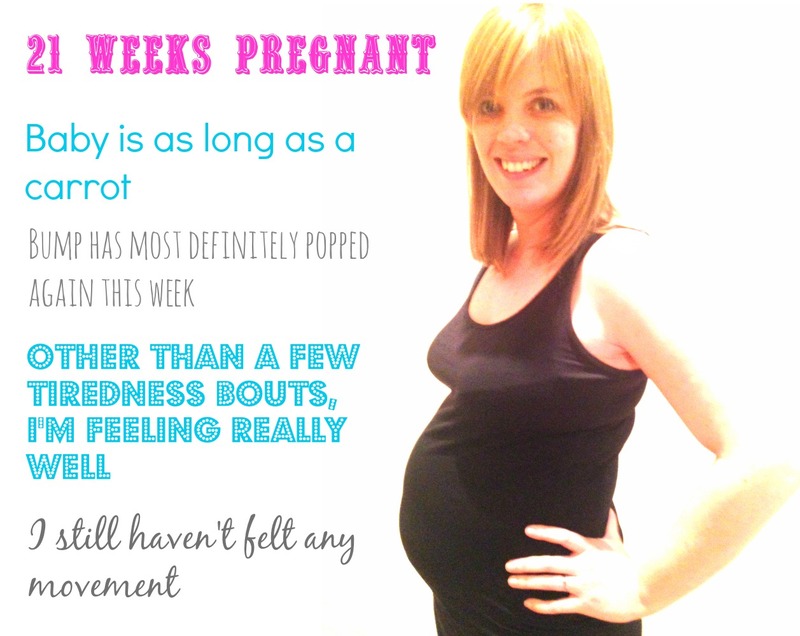 Looking: The bump has popped again this week. I feel massive and am a tad concerned that it will continue at this rate and I’ll be as wide as I am tall by the time this baby arrives. Craving: Still no real cravings. I really really wanted Rainbow cake from Simmons today, but I think I was just being plain greedy really. Sleeping: Still pretty good, but my hips have started to really ache if I lie in the same position for too long. I’ve started using a cushion between my knees which eases it slightly, but may need to invest in a pregnancy pillow soon. Baby is the length of: A carrot.